The thirteenth day of the month of Magha is the appearance day of Lord Nityananda, the associate of Lord Caitanya Mahaprabhu. 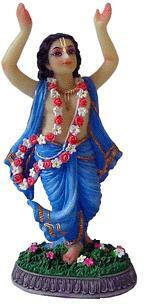 He is nondifferent from Lord Balarama. He is known to be the most merciful, even more merciful than Lord Caitanya. When the evil brothers, Jagai and Madhai, attacked Lord Nityananda with a clay pot, He was so merciful that He begged Lord Caitanya to forgive them. Thus being moved such compassion, Jagai and Madhai changed their lives and became devotees of Lord Caitanya. In addition, Lord Nityananda is known for “selling” the Holy Name for the price of one’s love and faith. He was constantly chanting the names of Lord Caitanya and assisting Him during the sankirtana movement. During this holiday, devotees read pastimes of Lord Nityananda from the Caitanya Caritamrta or Nityananda Caritamrta. Also, fasting till noon is observed.